"In the art of Friedman one hears the culmination of high-Romanticism. All the emphasis on beautiful tone, virtuosity, poetry, drama and elegance are united and reach their height in Friedman's art. His genius and encounters with Polish folk culture enabled him to perform Chopin's Mazurkas in a rhythmic manner resembling the accounts given of Chopin's own playing. In his youth Friedman championed Polish composers and played contemporary music. This decreased in time as he expected younger musicians to do so. Friedman performed with virtually every important conductor and many eminent soloists throughout his forty-year career. He had assisted Leschetizky and became one of his prized pupils: Leschetizky even stated that Friedman had surpassed him technically. 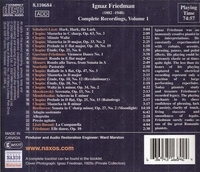 Friedman also studied composition and musicology with Hugo Riemann and Guido Adler. As a teacher he was insightful, effective and offered effecting advice and help to his many students, among whom are Ignace Tiegerman (whom he considered his finest), Victor Schioler and Bruce Hungerford. One cannot imagine playing more exciting, reflective and sonically ravishing than Friedman's." "More than a few of Friedman's contemporaries would wonder at the energy he displayed to remain on tour almost constantly until 1943. In 1920, Friedman gave his first concert tour of the United States, which paved the way for 11 return trips in the next two decades. Friedman remained as active in the 1930s as in the previous decades, but as political tensions grew in Europe, he decided to resettle once more, this time in Australia. There, and in New Zealand, he gave many successful concerts, some of which were broadcast. In 1943, Friedman retired from concert activity, owing to a partially debilitating paralysis in his left hand."